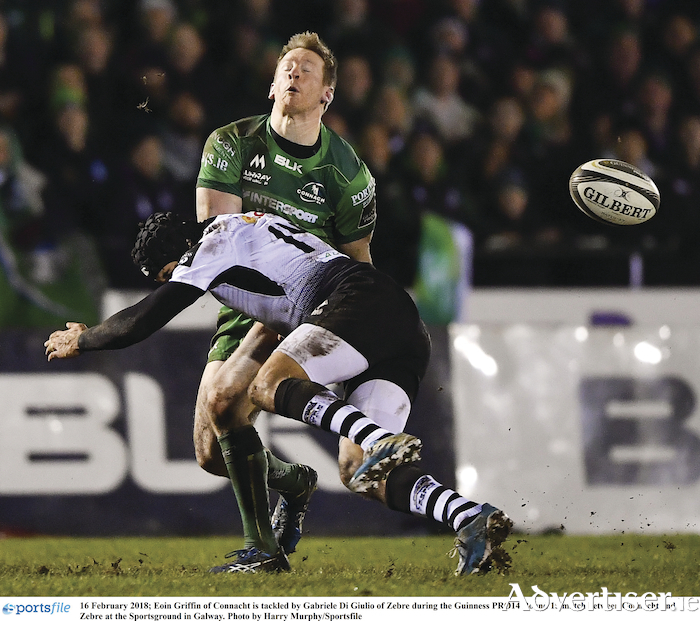 Eoin Griffin of Connacht is tackled by Gabriele Di Giulio of Zebre during the Guinness PRO14 Round 15 match between Connacht and Zebre at the Sportsground in Galway. Stung by defeat to Zebre, Connacht now look to improve the "mindset" when they head away for a 10 day tour that includes another Italian challenge and a first visit to South Africa. Both are formidable opponents. Benetton Treviso on Saturday (1pm ) are on a roll - eight wins from seven is their best record in the competition at this stage of the season. And then to the Cheetahs at home on the Highveld where it can take three weeks to acclimatise to the 1,400 metre altitude. To date Glasgow are the only PRO14 side to win at Toyota Park. Thus Connacht do have their "backs to the wall", says Kieran Keane after last week's disappointing 11-19 defeat to Michael Bradley's Zebre. And while the Connacht coach, after the weekly review, believes his squad were not as poor as he first thought because the "opposition were really good", they will need to play with a different attitude. "We were a little bit muddled, and it was an arm wrestle more than anything, and in that we got second," he says. "We will probably need to be a different team with probably the same players, but a different mindset. It will be what is in our heads. "We were in a good physical space, but we let ourselves down a little bit mentally, and the players have talked about the fact they were sort of looking for someone else or something to spark them. It has dented our PRO14 aspirations, and other results did not help us. I don't think it could be fatal, but it could be after the next two matches." Connacht remain in fifth place in Conference A table, with Cardiff's win over Munster having moved the Welsh outfit five points clear. Now Connacht face a confident Treviso who have improved considerably under fellow Kiwi Kieran Crowley. "I suspect Michael Bradley and Kieran Crowley have collaborated already, and we can expect exactly what we got from Zebre. I think there is little between the two teams. They are different in certain aspects, but they play to the strengths, and I think it will be a really torrid affair.
" Treviso are enjoying a really good run, playing with a lot of confidence as well, and they are at home. They will be a hell of team to overcome." Keane has some good news with prop Denis Buckley available after ankle surgery, while Ireland lock Ultan Dillane will be available for this Italian fixture having returned to the squad following the untimely death of his mother Ellen. Fellow internationls Bundee Aki, Kieran Marmion, and Quinn Roux will not be available, while Tiernan O'Halloran (hamstring ) will be assessed today and will be a "late call". Connacht travel from Venice on to South Africa via Dubai on Sunday with the same squad of 25, although there must be some flexibility for extra players to join if needed for injury cover. "It is a massive challenge, both games are, but it's really cool," says Keane. " We probably have our backs to the wall a little bit, but that might bring out the best in us." Connacht can be expected to respond positively, but last weekend's result could prove costly. Instead of closing the gap on the top four, the defeat widened it, not helped with with Cardiff overcoming Munster. It also halted Connacht's run of seven successive wins at the Sportsground, allowing Zebre to achieve the double over Keane's side for the first time in the history of the Guinness PRO14. Apart from Connacht's solid scrum, Zebre were on top throughout the contest, yet were still only a score ahead heading into the final minutes. But without the influential Tiernan O'Halloran (injured ), Bundee Aki (Ireland duty ), captain John Muldoon and outhalf Jack Carty (both in the replacements ), Connacht failed to control possession from the opening minutes. Connacht did carve an early opportunity when Gavin Thornbury's turnover set up a sustained attack, but several phases later centre Tom Farrell lost the ball. And with their attack making no headway, Connacht were forced to rely on outhalf Craig Ronaldson for two penalties. For the most part, however, Zebre's intensity, speed in defence, and their physicality at the breakdown kept the home side on the back foot. By half time Zebre were unlucky to be only 7-6 ahead, after right wing Gabriele Di Guilio was denied adding a try to an opening effort from No 8 Renato Giammarioli. And there there was no improvement for Connacht after the break. Within six minutes Di Giulio bagged a second try after an intense period of pressure with Canno's quick hands pivotal in sending the right wing through. Matt Healy provided Connacht with a glimmer of hope with a superb break up field, but Zebre continued to find huge gaps, and win the battle up front. They were deserving winners when captain and man of the match George Biagi blocked Kieran Marmion's attempted clearance for replacement prop Andew de Marchi to cross for their third try. Canno added the extras to extend Zebre's lead to 19-6, and it was too late when fullback Darragh Leader crossed out wide. Ronaldson was unable to convert for what would have been a small consolation bonus point for a poor Connacht performance. Zebre were deserving winners, but it proved costly for Zebre's fullback and former Galwegians player Ciaran Gaffney. Gaffney was replaced after six minutes with a serious injury and underwent surgery at the University Hospital. The 22-year-old, who joined Parma last summer, suffered an injury to his vertebrae, which according to the Italian club, required a vertebral stabilization intervention which was successful. Gaffney will continue his rehabilitation at home in Galway.